Ask any fitness expert and they will tell you at discipline and consistency are the keys to reaching fitness goals and maintaining them. The challenge for many people is sticking to a workout routine that allows for a full body workout. This can be difficult when you have to do cardio first and then move on to muscle toning. A lot of people tend to get winded and tired after engaging in a cardio workout and leave the muscle toning exercises out of their routine. Cardio is a great way to get one’s heart rate up, but it doesn’t do much when it comes to toning the muscles. One great way to ensure that you get the full body workout during every session is to do exercise that incorporates both the cardio aspect and the muscle work. You can easily achieve this by investing in the right equipment, like a rowing machine. For this review we will discuss the different features and what you can expect from the Stamina Body Trac Glider 1050 Rowing Machine as your choice of rowing machines. This can help you determine if this machine is worth the hype or not. The Stamina Body Trac Glider 1050 Rowing Machine is the perfect addition to a small home gym due to its compact size and foldable nature. The machine also comes with a set of wheels that allows users to roll it into a closet or tuck in a corner until the next rowing session. 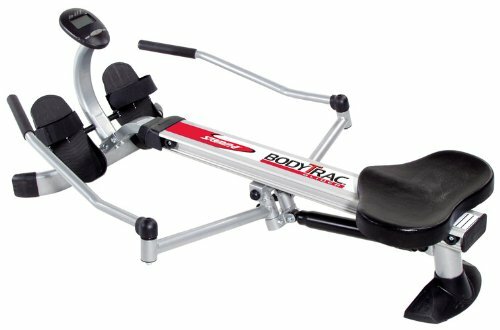 It is a very convenient and easy to row machine to have around the house. It is also one of the more affordable machines available that performs remarkably well and holds up to 250 pounds. It is very durable despite its light weight, mainly due to its sturdy aluminum frame. Setting up the rowing machine is a breeze as well. One person can manage setting up the rowing machine with no issues, a plus for people who live alone and are thinking of using rowing as their form of exercise. The machine has 12 different resistance levels that you can adjust manually to fit your needs and strength. Over time, you can increase the levels as you build stamina, which means your body can continue to develop and use the machine for years. It is also worth noting that the machine is one of the most affordable options you can find on the market today. There’s no need to spend too much to get the full-body work out your body needs. People who have experienced actual rowing are pleased to know that the machine mimics the actual rowing experience as well. It is an excellent substitute for rowing on water on days that the weather does not allow you to row outside. Another big advantage of this particular rowing machine is its noise level. Whereas most machines are notoriously noisy this is relatively quiet, allowing users to enjoy watching TV while exercising without any problems hearing the audio. This makes working out more enjoyable, especially when you are pumped up with the right music. The biggest issue with this rowing machine model is the foot straps and foot rests that come with it. Many have noted that it does not secure the foot in place, which can be very dangerous as you gather speed while using the machine. Be extra cautious when using the rowing machine with intense speeds as your foot might slip and cause injuries. It is also advised that users wear proper shoes when using the rowing machine to help secure their feet on the foot rest. Also, take note that some parts of the machine are made of plastic. These parts are susceptible to damage, especially when the machine is used frequently and intensely. Give your machine a check to see if there is damage to any important parts. If you notice any, make sure that the machine is still safe to use before proceeding with your workout session. Safety is still a priority so always be on the lookout for parts that might need replacing or repairing. For a compact and affordable at home rowing machine you cannot go wrong with the Stamina Body Trac Glider 1050 Rowing Machine. Just keep in mind that this is a “budget machine” so do not compare it with those you find at your local gym.